Glass: tall stemmed glass, narrowed towards the top or in a sturdy beer mug. Goes best with: salads, light fish and poultry dishes, spicy and roasted dishes. 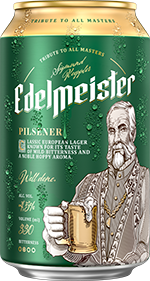 Edelmeister 0,0 is a completely non-alcoholic light beer, delicately dry, with a pleasant hop bitterness which intertwines with the sweetness of barley malt. A masterfully brewed, mature beer with its alcohol content removed using specialist technology, resulting in an un-compromised taste of beer. Excellent for any occasion for people who don’t want to abandon the pleasure of drinking beer. Excellent at quenching thirst for those who like to have fun and live actively. PURE MALT. ONLY 3 INGREDIENTS. Brewed exclusively from crystal clear water, high-quality Pilsner malt and hops. Without any additional ingredients. As a result, the beer retains its full taste. The art lies in simplicity, the fewer ingredients, the better. Only water, 100% barley malt and hops. 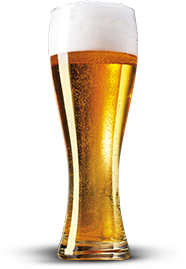 Edelmeister 0,0 contains fewer calories than its alcoholic counterpart, only 24 kcal in 100 ml of beer! Glass: in a sturdy mug. An ale with a delicately sweet and citrusy taste (coriander and orange aroma), refreshing, with a dry, often sour finish. The beer is characterized by a refreshing, slightly sour taste and mild bitterness. The Witbier, also called the white beer (biere blanche) – is a Belgian variety of wheat beer. It is distinguished by the addition of wheat (non-malt addition) to the production process, which makes the beer appear cloudy and white. In this variety it is typical to also add mixed spices and fruits, such as coriander, sometimes the zest of sweet and more often bitter oranges (Curaco) to complement the sweet and fruity aroma. Glass: in a heavy, straight glass. Temperature: 6-8⁰C strongly chilled, however it yields the best aroma in a temperature of 11-12⁰C. Goes best with: salads, light soups, vegetarian meals, sweet Asian cuisine dishes and fruit desserts. In the Netherlands it is customary to serve it with slices of lemon. Schwarzbier in German means “black beer”. 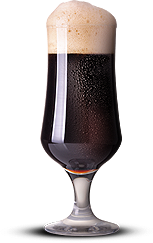 It is a dark lager originating from the south of Germany, with a distinct but not dominant bitterness, a burnt aftertaste of coffee and caramel, with a long lasting, creamy foam. An ideal choice for those looking for deep, full and original flavors. It hides a smooth and pleasant, creamy lager beer. EER BREWED WITH THE ADDITION OF WHEAT. GRAINY AROMA WITH TOUCHES OF CORIANDER AND ORANGE PEEL. WONDER FULLY REFRESHING. Glass: in a stemmed beer glass, holding it by the stem and drinking cold, or cupping the bowl and warming it delicately to feel the toffee and chocolate aromas. It can also be served in a beer mug. Goes best with: spicy grilled meals and dark sauces, sweet chocolate desserts. Ale light in its taste, refreshingly tart, delicately fruity, with a banana and clove aftertaste and subtle sweetness. The Weizenbier is a typical German wheat ale, naturally cloudy and unfiltered. It is a synonym of refreshment, light and delicate. A high content of wheat malt (min. 50% of ingredients) used during the production process and yeast activity is responsible for the clearly distinctive banana aromas and light hints of cloves. The production of this beer type does not use any non-malt additions. The beer is ideally suited for summer temperatures. NIQUE COMBINATION OF CLOVE AND BANANA NOTES CREATING A BEER WITH A MILD GRAINY, AND TRULY REFRESHING TASTE. Glass: glasses with bowls widening towards the top – effectively showcasing the foam and accumulating the aromas. Goes best with: roasted pork and beef, salads, soups, vegetarian meals, sweet Asian cuisine dishes and desserts. A refreshing mix of light beer with lemonade. The Radler flavor is distinctive, refreshing, with hints of fruits and a slight bitterness. Our Radler Lemon contains 55% beer mixed with lemonade (45%), which still makes it a beer, not a beer based drink. It works excellently during summer activities. It can be used as an interesting base for mixing drinks. OMBINATION OF LEMONADE AND A LAGER BEER. TASTEAND FRESH AROMA OF CITRUS RESULT IN PERFECT REFRESHMENT. Glass: in a thick glass (jelly glass) or stemmed beer glass. Temperature: 2-6⁰C – very strongly chilled. A refreshing combination of European lager (55%) and a grapefruit flavored drink (45%), with a dominant grapefruit aroma and flavor. The subtle bitterness of beer and citrus fruits adds it a distinct character. It is excellent at quenching thirst. Tastes best when chilled well. Glass: a thick glass (jelly glass) or stemmed beer glass. Temperature: 2-6⁰C very strongly chilled.